The most eagerly anticipated ad of the holiday season—and probably the year—rolled out Friday, as British retailer John Lewis unveiled its latest heartwarming Christmas commercial, heading to the moon for a magical story about loneliness, connection and, yes, how the right present can make everything a little better. The campaign, as usual, was crafted by adam&eveDDB, which has almost singlehandedly turned Christmas in Britain into a kind of Super Bowl for advertising, beginning with its celebrated spot "The Long Wait" for John Lewis in 2011. And in a first for the brand at Christmastime, a woman—Kim Gehrig of Somesuch—was tasked with directing chores. It was always going to be tough to top last year's near-perfect "Monty the Penguin," but "Man on the Moon" has its own unique charms. (Gauging by the initial reaction on Twitter, it's hitting plenty of people "right in the feels.") And it also has a laudable charity aspect that suits the season well. "Man on the Moon" goes for something similar, with another child who wants to give as much as receive. And it's nice to see a girl take the lead this time, as boys were the stars of both "The Long Wait" and "Monty." The storytelling here, while it doesn't have the kind of twists that made those earlier ads so special, is still plenty evocative. The grandness of the idea and the cosmic visuals contrast beautifully with the girl's simple, small act of kindness. (OK, the engineering behind that balloon flight is professional grade, and something we'd best not overthink.) And the spot's resolution once again shifts the viewer's perspective, if more subtly, turning a flight of fantasy into a very real and emotionally charged call to help older people feel less lonely—at a time of year when that's a more heartbreaking problem than ever. It wouldn't be a John Lewis Christmas ad without a celebrity cover of a famous song. And this time it's 19-year-old rising star Aurora (her very name ties into the theme) doing a version of the Oasis song "Half the World Away." It's a lovely, ethereal take (though predictably, it's getting mixed reaction from Oasis fans). The spot launched early Friday online and will have its first TV airing Friday night on Channel 4's Gogglebox. As part of the campaign, John Lewis has partnered with Age UK to help some of the million older people in the U.K. who can go for a month without speaking to anyone. The retailer will support the partnership with in-store and online activity, and will donate proceeds from the sale of select Christmas merchandise to the cause. As part of the campaign, John Lewis will open moon pop-ups in 11 stores, where shoppers will be able to take photos with a lunar backdrop, and learn about the moon as well as Age UK. A Man on the Moon app uses augmented reality to bring the moon to life when pointing a phone at special posters and John Lewis shopping bags. The app also features a Man on the Moon mobile game. The campaign might not be quite the merchandizing juggernaut that "Monty" was, with its adorable stuffed animals (though among the Twitter jokes was this gem: "John Lewis has already sold out of old men"). In all, it's a fine showing from an agency and client that are under huge pressure to deliver something spectacular every year. "Our Christmas advert is once again all about going the extra mile to give someone the perfect gift. 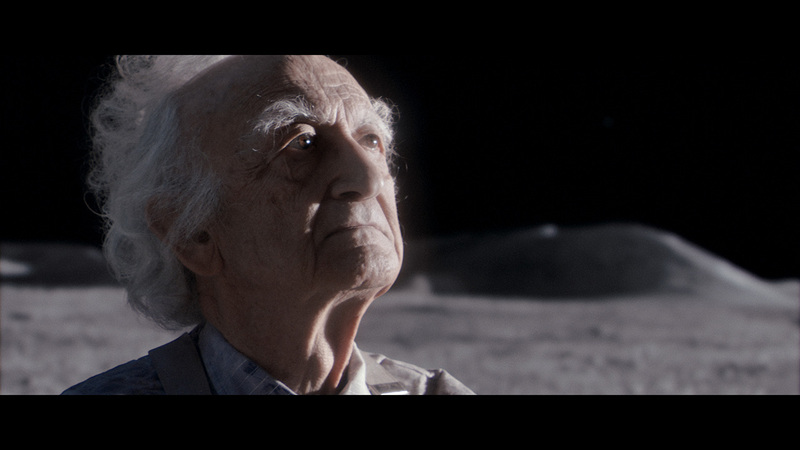 This year though, the story is told in a uniquely creative and engaging way as we see Lily, our heroine, go to great lengths to connect with the Man on the Moon," says Craig Inglis, customer director at John Lewis. "We hope it inspires people to find really special gifts for their loved ones and through our partnership with Age UK, raises awareness of the issue of loneliness among older people and encourages others to support in any way they can."